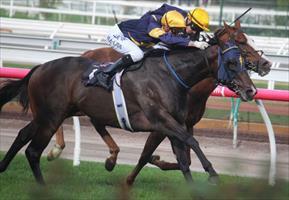 He may not win by a big margin but there is no doubting that Loyalty Man is a classy galloper, his Flemington victory on Saturday indicative of better things to come. It was the third success from his last four starts for the promising three-year-old who is now likely to head to the paddock in preparation for a spring campaign. Always travelling well for his regular rider Jake Bayliss, Loyalty Man looked ready to win by a dominant margin only to lose a bit of concentration late. "He travels up like he is going to win by three or four lengths," Bayliss said, "but he hits the front and clocks off, he thinks it's game over!" "But when there is a bit of competition he comes again, he is a very nice horse." Bayliss is confident that Loyalty Man will be all the better at four - "I think next time in he is going to be a very serious horse." A beautifully bred son of Fastnet Rock who caught Paul Moroney's eye at the 2014 Magic Millions, Loyalty Man is out of the French Group One winner Imperial Beauty. It was a winning weekend for Ballymore with another success story on Sunday - Strike Force finding the line in determined fashion at Bendigo. Having only his second run back from a spell, the up-and-coming three-year-old jumped fast in a 1300m contest, holding a lead along the rails and finding plenty when challenged on his in and outside in the run home. "He got it cheap early," reported jockey Ryan Maloney, "and when we quickened up from the 600m he responded really well." Describing Strike Force as "a beautiful horse to ride," Maloney said that there is more to come for the lightly raced chestnut. "He gives me a good feel and he is a nice progressive horse who is doing everything right." Another Magic Millions graduate selected by Paul, Strike Force is a son of Lookin At Lucky and a daughter of the Gr.3 winner Dancer's Choice. It was not a lucky day out for Sound Works at Canterbury a couple of weeks ago, the promising filly doing it tough out wide and wanting to pull before fading in the run home. A dominant winner of her previous start, the daughter of Not A Single Doubt has bounced back well from that latest tough run and from barrier three at Canterbury on Wednesday she looks "hard to beat." "She has finally drawn a gate," a relieved Moroney said. "She strikes a strong race but it is best to overlook that last run as she had run her race by the time they got to the turn." "She has a nice weight drop this time and can be right in the finish." Moroney is also buoyant about the prospects of our other Canterbury runner, the lightly raced four-year-old Fortune Patch. Also by Not A Single Doubt, he was a gallant second at the same track two weeks ago and he strips fitter for that, his first run since last spring. "He has trained on really well since and there is no reason why he can't run another good race." "He is developing into quite a nice horse," Moroney continued, "and he looks a big chance." Meanwhile at Sale we have Bonnie Belle stepping up to a mile at her third run back from a spell. "She is up in class," Moroney conceded, "but she strips fitter for her last two runs and being quite a robust mare she does improve with racing."